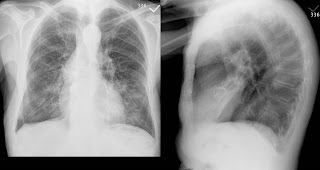 29 y/o female starting experiencing severe shortness of breath almost 5 years ago. Went to health clinic at her univeristy and was told to jog in place while wearing pulse ox. Saturation dropped from normal at rest to low 80's within the first 1-2 minutes of exertion. This pattern of desaturation repeated when probes were placed on head and ears. Sent for pulmonary consult, originally heard wheezing and was diagnosed with exercise induced asthma despite normal PFT and negative methocholine challenge. Desaturation with exertion did no improve with prednisone, oral chorticosteroids, singulair, etc. Sent for further testing including V/Q scan, doppler of lower extremities, echo, stress echo all of which were normal. Sent for contrast echo w/ bubble study and a few bubbles were seen. Referred to another insttution for further investigation of possible shunt. A second bubble echo study was again positive for a late shunt. Sent for exercise right heart cath. Patient desaturated w/ exercise during heart cath (measured directly), but no shunt was observed. Cardiac output was abnormally high by Fick method only. 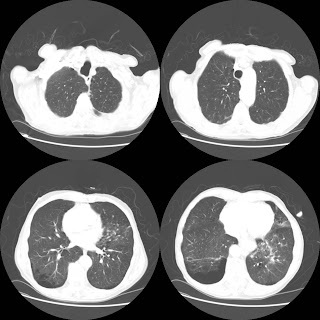 Sent for further imaging to look for shunt elsewhere in the body (mri's, ct's, etc. of abdomen, chest, brain) with only minor, seemingly unrealted findings. Partial pressure O2, abnormal as well. All autoimmune and other bloodwork normal except low ferratin but high serum iron. Sent to neurology for possibility of mitochondrial/metobolic myopathy. Muscle biopsy shows very mild depletion of cytochrome c oxidase, fiber size variability, diffuse smallnes of fiber size but is otherwise non-diagnostic. Patient continues to destaurate on 6 minute walk test at some times and not at others. Cardiopulmonary exercise testing shows 58% of predicted VO2 max when tested to 98% of predicted heart rate. Abnormally high heart response to workrate. Early anaerobic threshold (33% VO2 max) and increased ventillatory response. Patient has never received any diagnosis and would now like to have a child and is seeking medical advise about whether to conceive. Any insight or DDX would be much appreciated with this complicated case. Hey good stuff here. Check out my new RT blog. The Respiratory Cliff.